Wow this is great, nothing like having your household skull kitted out for Spookilicious fun! 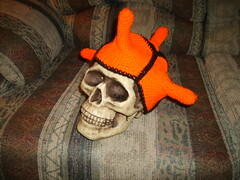 This is brilliant, made by Geminimind on Ravelry from the pattern by Woolyworm head http://www.ravelry.com/patterns/library/hat-of-horns from the Anti-Craft, Samhain 2006. Hubby is driving, kids are staying at home (first time by themselves but only for one night, they are at friend’s houses Friday and possibly Saturday.) EEK a coming of age for all of us. I hope you come to see us if you’re in the Portland Area! Don’t forget Friday from 5-8pm and Saturday from 12-4pm…Be there or be round! This weekend I’ll be down at the Oregon Flock and Fiber checking out all the scrumptious fluffy goodness! If you are there look for me! Don’t feel shy come introduce yourself! Also, while there I’ll be inviting YOU and your friends to show up at Twisted on Broadway in Portland October 30th and 31st (yup Halloween). International Fiber Artist and CLF Member Rockpool Candy has her mind set on getting crocheters and handspinners together to make a GIANT spider’s web that we will then felt somewhere, some how (workin’ on that). BUT THAT’S NOT ALL! Jimbo will be present with his GIANT HOOK, yup we’re going to see if this HUGE HOOK will make it into the Guiness Book of World’s Records for the Largest USEABLE crochet hook! I can’t wait to see this! Friday October 30th all day or drop in from 5pm -8pm to enjoy some festivities! Saturday October 31st special happening kicking off at 12noon going until 5pm! Fall Issue of Crochet Uncut! Hey hooksters the unofficial official magazine of the Crochet Liberation Front: Crochet Uncut, has released it’s Fall Issue! Just in time for our itchy fingers to get busy! Also a few places of note: The fourth weekend of this month called September, I’ll be trekking down to the Oregon Flock and Fiber with my good friend, nature photographer Bec Thomas to see fibery goodness, and hopefully hook up with Myra Wood who is teaching a wonderful class at this huge event! YAY! Then my family and I are heading down to Portland Oregon for Halloween to hang out with Inga (Rockpoolcandy) and Jim (Jimbo) to do something with the world’s largest crochet hook, handspinning, crochet and a spiders web! Stay tuned for more information! If you are a spinner/crocheter or like to goofy and are in the Portland area and want to help let us know! This week, I’ll get more pictures done of the loot I’m carting home, and decide (eep, that’s not going to be easy) on who wins what in the CLF Baby Got Drape competition. Tomorrow the drive will take me about five hours, and I plan on winding home leisurely while looking very forward to my next visit, which may be in September for the Oregon Flock & Fiber festival! Any chance to stay with my dear friends Gabrielle and Thomas Chavez is grabbed up greedily! Gabrielle is a raw food chef par excellence! So, I always leave here not only rejuvenated by the decade long friendship and commeraderie, I also leave with a full tummy, and feeling very healthy! How’s that for bang for your buck! I want to give the Chavezes a little plug here, since there are a few spaces left for the Raw & Living Spirit Retreat at the end of August. It’s very very worth the time and exceedingly affordable and transformational experience!